If you have no evidence, there's not much we can do for you. We do not simply take people's word for truth. You were banned 30 minutes for racism. By the tone of this post, I have a feeling the admin did his duty correctly. Either fill out a report or wait for the ban to expire and continue playing. I muted you because you kept saying the same thing over and over again even after asking to be stopped. I never said i hate deaf people either. Also for the racism. You said the n-word in chat, also you threated me aswell. You said if i didnt unmute you. Something bad would happen to me. We have chat logs, we can see what happened. As for the nono word, it doesn't appear in the logs because it gets filtered out by our chat filter so I don't know if that happened or not, but what I do know is that you DID in fact threaten void (as seen in the screenshot above). 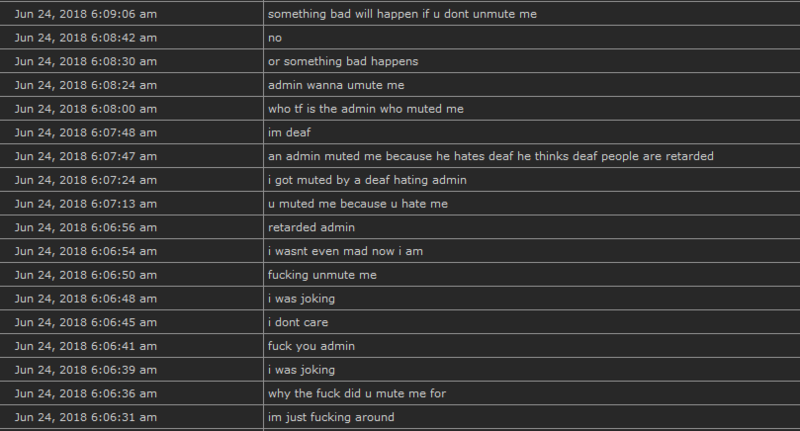 I can also ASSUME from the logs that void never muted or banned you or whatever because you were deaf, rather you accused void of muting you because you think that he has something against deaf people. Please be sure to follow the template provided in the stickied threads on that board. If you do not provide any evidence, the report will most likely be closed.